Carpenter Pencils. Available in selective paint colors. 1 or 2 sides imprinted. Various imprint colors available. We offer competitive prices on carpenter pencils. Our carpenter pencils can include your custom imprint which makes these pencils a great advertising or promotional value. Carpenter Pencil Soft, Medium and Hard Leads available. Prices above are for 1-side/1-color imprint. Contact us for 2-sided imprints or Combination and Red Lead. 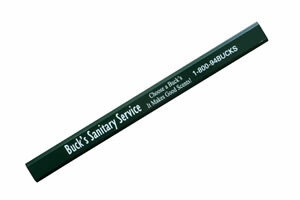 We offer many other type and style of customized pencils. Check the following pages or give us a call at 706-374-0710 and we will help you selected the best pencil for your needs. Free quotes available. Personalized Pencils - Imprint your personalized "Name" over selected patriotic and other colorful designs.